When Customer Development and the Lean Startup were just a sketch on the napkin, Dino Vendetti, a VC at Bay Partners, was one of the first venture capitalists I shared my ideas with. Dino and I kept in touch as he moved up to Bend, Oregon on a mission to engineer Bend into a regional technology cluster. Over the years we brainstormed about how Lean entrepreneurship would affect regional development. I visited Bend last year and caught up with his progress. This post and the two that follow highlight what Dino has learned about the characteristics of the startup and investing landscape in a regional market, and what it takes to intentionally engineer a thriving regional tech cluster. Today, with every city, state and country trying to build out a technology cluster, following Dino’s progress can provide others with a roadmap of what’s worked and what has not. 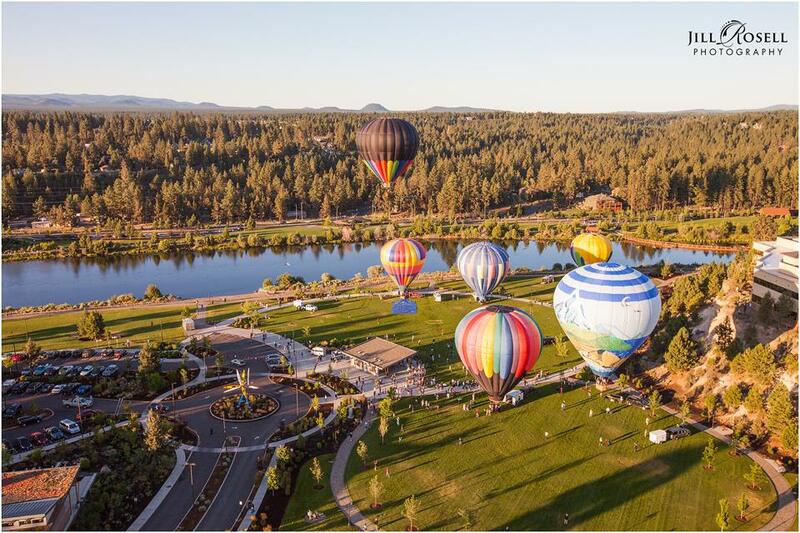 Bend, Oregon is an ideal case study because of its size, location and entrepreneurial characteristics. Let’s get right to the point… I fell in love with Bend, Oregon, once a sleepy logging town, now population 79,000. If you like skiing, hiking, biking, rafting, golfing, camping, fishing, picnicking, rock climbing, and startups – you’d like Bend. Before moving to Bend last year, my career took me from engineering development roles at defense contractors in the 80’s to product management and executive marketing roles in companies like Qualcomm in the 90’s, to the world of venture capital at several firms including Bay Partners, Formative Ventures and Vulcan Ventures. After several visits skiing here, I had become smitten with the “mojo” of Bend – its superb quality of life, recreational opportunities and proximity to the San Francisco Bay Area. The vibe of Bend is appealing, unique and unpretentious given the number of successful business, tech and professional athlete transplants who call it home. It’s home to a small but growing tech community that has been developing over the past decade, and that’s what piqued my interest. The differences between the Bend, Oregon region and Silicon Valley are obvious. The sheer density of talent, companies, capital and universities that exist in the Valley are second to none. It truly is the epicenter of the startup world and it’s the regional cluster for innovation and entrepreneurship. Working in the Valley, I took for granted the constant and real time networking opportunities, the volume of deals, and the ability to access nearly every corner of the tech industry – no surprise to anyone who has spent any time in the Valley. However, what I found in Bend was a deeply entrepreneurial community that is leaps and bounds beyond just a destination resort town. Bend fights way above its weight class and is professional scale for its size. Its ability to do so is tied to the deep entrepreneurial DNA that permeates the region (a very similar characteristic to Silicon Valley), originally out of necessity and now out of strategy. Job creation in Bend is everyone’s business. People who make the move typically need to start a business to have a job. Bend is the 16th largest metro area in the country for high-tech startup density. Pretty amazing for a town with fewer than 100,000 people. 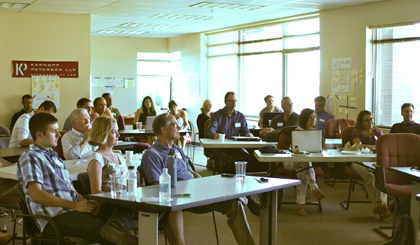 So what types of entrepreneurs and startups exist in Bend? There’s a concentration around several sectors: software, hardware, medical-technology, aviation, and a specialty of Oregon – craft beer brewing. The chart below shows the clustering of startups around these sectors. 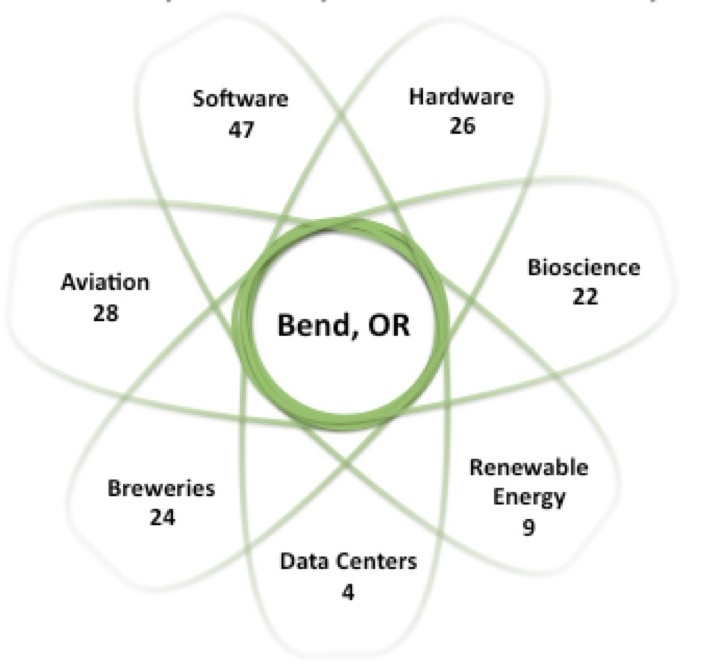 In addition to the four major data centers that include Facebook and Apple, Bend currently boasts 95 startups across multiple technologynsectors: 47 software, 26 hardware/semi and 22 med tech related startups. Nearby Portland Oregon (just 160 miles away) is home to over 300 startups; between the two markets, nearly 80 new startups are forming each year. In addition to local entrepreneurs building startups, I found something else I wasn’t expecting in Bend: a deep pool of talented Valley transplants who’ve made their way to Bend – either during their careers or after. There are retired Fortune 500 CEOs, senior execs from Valley startups and public companies as well as successful entrepreneurs who exited their companies. These smart, successful transplants have gotten involved with the local business community as mentors, advisors, entrepreneurs, or investors. But the real surprise was learning that for some Bend is a Silicon Valley bedroom community. A daily direct flight on United can have you in your Bay Area office by 8 a.m. Monday. Every week I meet someone new who just moved to Bend and commutes to work for Google, Facebook, Salesforce, Oracle, Marketo, Workday, and on and on….These people are important and useful in the engineering of a tech cluster; as startup coaches, angel investors and advocates for the community. They communicate and pass on the DNA of how Silicon Valley operates and what level of performance is needed to compete on a global scale. Scalable entrepreneurs similar to those you would find in Silicon Valley (although a smaller concentration exists in Bend). These entrepreneurs want to build a big company. They’re typically Silicon Valley transplants who had enough success and experience to know what they were getting themselves into, what it means to raise capital from investors, what it means to scale a company, and how to engineer an exit. Viable entrepreneurs who think they are building scalable startups but lack either a key element of their business model and/or lack the right team DNA to “go for it..” In this region, these are the majority of new startups I see. They have two limitations, which I help coach to see if they have the capability and desire to become scalable. They go after a market opportunity that’s too limited to result in a truly scalable business (still might be an M&A candidate, but at the lower end of the range). Most teams have a reluctance and willingness to “go for it” when they finally do have a scalable business and have validated the key aspects of their business model. This “small business” mindset is a holdover of how capital starved early stage startups are/were in Oregon. Entrepreneurs (and angel investors) prioritize profitability over growth (this is OK for lifestyle startups, but not for scalable startups where capturing market share and thought leadership is vital). Lifestyle entrepreneurs who are just building a business to make a profit and support their awesome lifestyle (Bend has a lot of these). There is nothing wrong with lifestyle entrepreneurs as they are providing valuable products and services to the local/regional economy, but these do not make for good venture or angel investments under the traditional equity based venture model. Regional entrepreneurs are at an inherent disadvantage in getting the attention of customers and late stage VCs. Therefore they need to focus on building the most efficiently scalable business model possible. Without focus, it’s difficult to create enough signal to noise ratio to become relevant in their market segment. The good news is that whether you are an investor or accelerator, if your startup is located in an advantageous regional market (defined below) and if you apply lean methodologies, you can improve your on-base and slugging percentage. The evolution of very capital efficient business models and Lean Startup methodologies has led to easier paths to funding, launching and growing businesses. With a tech cluster developing in Bend, it was clear that there were four missing pieces in its infrastructure. I decided to fix each of them. Bend needed a startup accelerator. While entrepreneurship in Bend was talked about, and everyone read the same blogs, there was no central place founders could get focused and intense coaching and mentorship. So I co-founded the FoundersPad accelerator, a 12-week, Lean Startup program focused on customer development that helps founders develop, refine and grow their business. Bend needed its own venture firm. While Silicon Valley and New York are magnets for great startups, our bet is that awesome startups exist in (or can be attracted to) Oregon and Northern California. So I launched Seven Peaks Ventures with a team of investors that includes some of the region’s most active angel investors. We help Oregon-based startups build and scale their businesses by providing highly relevant mentoring and leveraging our deep network in Silicon Valley and beyond. Bend needs to attract more entrepreneurs. So I launched The Big Bend Theory with Bruce Cleveland. We’ll fly founders and their spouses/significant others along with a team member to Bend to meet local startup executives and community leaders and experience the lifestyle. If they choose to relocate in Bend we’ll offer free temporary office space and help get them funded. We are engineering the infrastructure that lacks: accelerator, venture firm, outreach, university and training. Seek out the truly scalable startups. This is amazing. It’s making me wish I lived in Bend. Great read, looking forward to part 2. I was born and raised in San Diego and moved to Bend 2009 with no regrets! Many of my clients are from the Bay Area and they just love it here. The need to create a more diverse and sustainable economy is a key building block to making the region more vibrant and the enthusiasm and energy that startups create is amazing. Thanks for sharing! The high concentration of craft breweries makes for an ideal launch bed for disruptive tech in brewing. Brew-preneurs could have a field day assembling use cases from new tech in filtration, mixing, etc. I’m totally serious. Great story about building a technology cluster. I would like to build a digital health or health tech cluster in Vancouver, BC Canada. Let’s chat soon. Vancouver would be a great place for a health tech cluster. Vancouver has an incredible mix of university, skills, tremendous health system, life style and capital (although much of it is illiquid). Also, there is a will to succeed (Innovation Boulevard being the latest incarnation of this). Keen to support. Thanks for the comments… Bend is an awesome place so come visit and look me up! Speaking of craft breweries Bend is also home to one of the fastest growing Kombucha breweries in the country called Kombucha Mama who is doing some innovative stuff in their production. I am a significant property owner in Bend (hospitality and residential) who lives in the Bay Area. I have always felt Bend had enormous potential to be a center of entrepreneurship. The lifestyle is awesome, people friendly, and compared to Northern California, the cost of living is actually reasonable, not to mention much lower income tax rates and no sales tax. I am very encouraged by the development work Steve Blank is doing to realize all this incredible potential and I look forward to seeing Bend grow as a regional center of entrepreneurship.